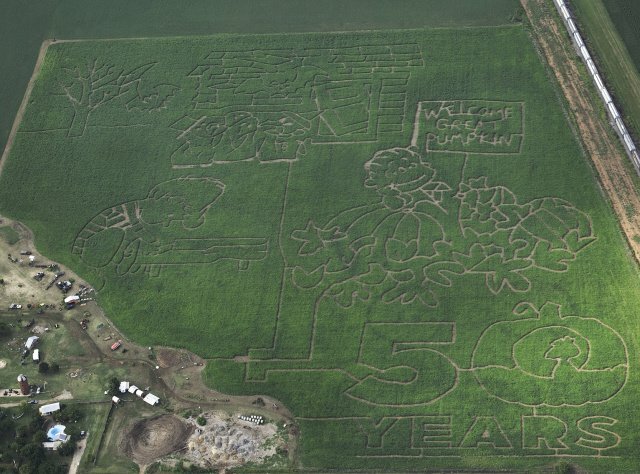 Celebrate the magic of autumn with a trip to The Maize at Reding Farm in Chickasha and enjoy over 35 acres of cornfield mazes. Known as the largest maze of its kind in Oklahoma, this maze will have visitors trying to search for their way out as they twist and turn amidst the corn stalks. Visitors to The Maize will also enjoy hayrides, an on-site pumpkin patch filled with bright orange pumpkins, fire pits, Hay Mountain and more. Bring the kids to see the farm's resident horse, mule, chickens and rabbits. Sit around drinking hot chocolate and making s'mores by the campfire, or try your hand at shooting corn and pumpkins from the farm's popular corn cannon. A children's cow train is available for trips around the maze and farm and the farm's dairy-go-round is really a hit with the children. Also, check out the Harvest of Fear Haunted Maize during the Halloween season - you will not believe how scary it is. Combo: $25 While every effort has been made to ensure the accuracy of the pricing listed above, prices are subject to change without notice. From I-44, take Exit 83. Travel west to Hwy 81/4th St. Go north to Reding Rd, then west to the Maize.